← Dom’s Triathlon Challenge ! A Summer of Sun, Fun and Fundraising. In March of this year we started our fundraising drive with the intention of building a hydropool in our garden so that we can keep Dominic as fit and healthy as possible by getting him swimming daily. Dominic had the idea that he could do some sponsored events to help raise money and this soon developed into him doing a Triathlon, the plan being to do one event a month for three months. That was why on a glorious summer’s day on 18th May we then found ourselves on the starting line of the East Grinstead Tri-Clubs annual children’s triathlon. I was a bit worried about this as normally when Dom is on his bike he likes to stop for a chat or a look around and does not usually go very fast. I was expecting to the 800 metre course to take us around half an hour to forty five minutes. After some last minute adjustments to the bike we were off. Dominic was like a man possessed and his legs were whizzing round. With fantastic support from the crowd and encouragement from supporters like Ben Kenward he managed the whole course in seven minutes, which was a tremendous achievement. Dominic received a fantastic round of applause as he went through the finish line and was buzzing with excitement all day, although shattered the next. The Tri-Club were great about the whole thing and gave us some of the proceeds from the day towards the pool. The next event was a cake sale held on 27th June by one of my friends from work Stacey Sholeh, Stacey makes fantastic cakes to order in her spare time. She organised it, baked all the cakes and made sure all the staff and officers in Wandsworth knew about it. Typically on the day I was then sent from my normal place of work to a course in another part of the Borough and did not get to taste anything. Stacey managed to raise well over £200.00 and I am told the cakes were amazing. We were due to hold the second part of the triathlon on Dominic’s school sports day but we did not want to take anything away from the other children so he did this on 7th July. I could not take the day off work but Sarah attended and tells me there was not a dry eye in the school. Dominic walked in his walker once round the school playground with practically the whole school (except his brother who was stuffing his face!!) chanting his name. This would normally take Dominic some time and Robyn, his physio, would have to steer his walker and help him along when he loses motivation. Dominic again excelled and managed to walk around in around four minutes, another fantastic achievement. The video is amazing and if you get a chance have a look. The last event for Dom was his swim. The plan was for him to do two lengths of a 25 metre pool with minimal assistance. Again there was great support and Ben and others were there to encourage Dom. Although we had planned to go to the Olympic Park in the end we decided to do it locally and the swim took place at K2 in Crawley. Dom was inspired once more and did two lengths in two minutes eleven and even his hydro-therapist was amazed at how well he had done. 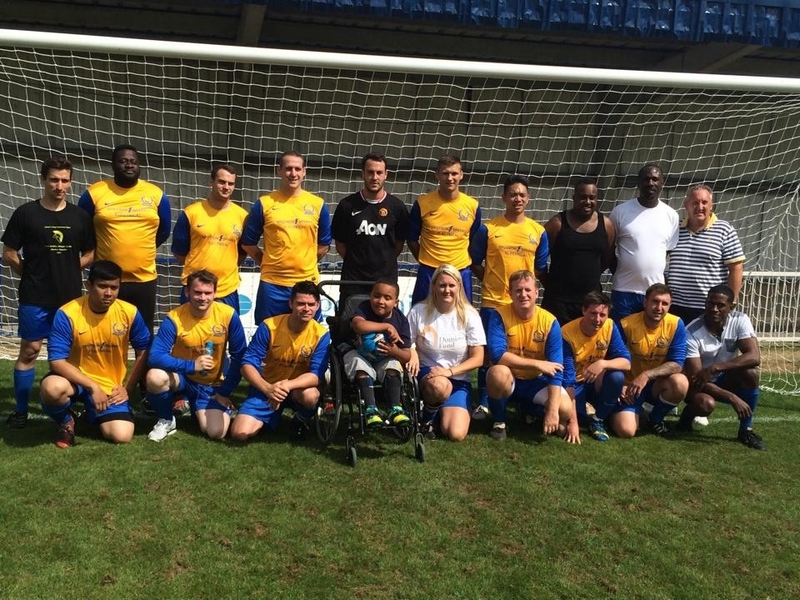 The next event was organised by Amy Cope, one of my colleagues and she had the idea of a charity eleven-a-side football match for Dom. Amy organised everything, the pitch, referee, manager, opposition, raffle prizes and did a great job. This took place on Sunday 3rd August at Imber Court in Surrey. We were lucky once more with the weather and I even got to dust off my boots after not having played for well over 10 years. There was a fair crowd of supporters, it was a fantastic day and a competitive but friendly game ended in a 1-1 draw with Ashley Meek scoring a screamer of a goal for our team. On the day we raised well over £700.00 pounds. I certainly suffered afterward though!! It was the first time the boys had seen me play and Dom in particular loved the game. The final event was organised by Charlotte Wall another colleague of mine and was a sponsored bike ride from Buckingham Palace to Windsor Palace. Unfortunately I was not able to take part as Dom had a hospital appointment but around eight people did the ride and they all appeared to enjoy it, although some were a bit saddle sore afterwards. So far they have raised around £500.00 towards the pool. All in all it has been a very good summer. All the events as well as raising lots of money have been really good fun, we have been lucky with the weather and we have been lucky in that people have been very generous. Thanks go out to those that have organised events, anyone who has donated money, Barney Durrant for helping us with publicity and those such as Ben Kenward and others that have helped to inspire Dom while he was doing what for him were very difficult physical challenges. It would be nice to end on a high as the fund is going well but there is still a way to go so we will continue fund raising over the next few months. The next event is a parachute jump by my younger brother Ricky who also dazzled with his football skills during Dom’s recent game and our next door neighbour and some of her friends are planning to go down a mile long zip wire! !